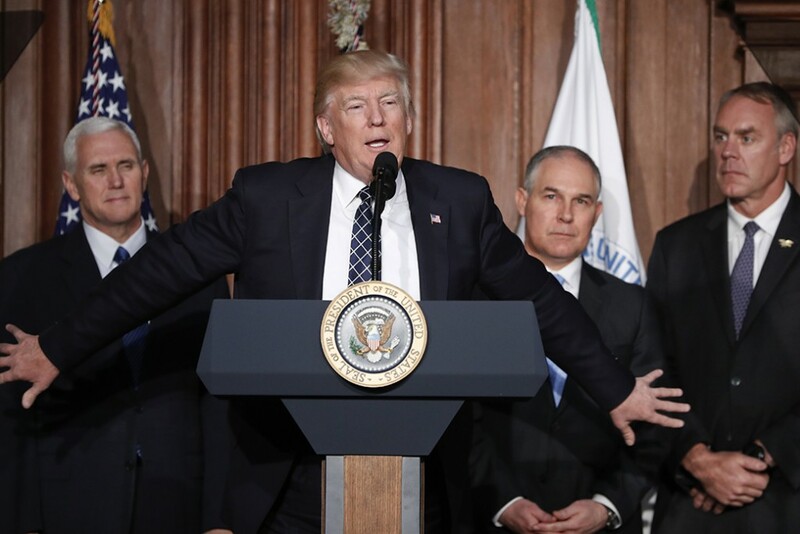 The core mission of the Environmental Protection Agency, or EPA, “is to protect human health and the environment.” As part of that mission, the agency works to ensure that “national efforts to reduce environmental risk are based on the best available scientific information.” During the first four months of 2017, President Donald Trump, EPA Administrator Scott Pruitt, and their allies in Congress have proven themselves hostile to the role of science in achieving the agency’s mission but all too willing to heed the requests of polluters. Here are the top seven ways in which science is already under siege at the EPA. Chlorpyrifos is a common agricultural pesticide that causes neurological harm in children who were exposed to it in utero. In 2016, the EPA’s scientists concluded that the agency should ban chlorpyrifos after finding unsafe levels of the chemical on apples, peaches, oranges, and other fruits. Dow Chemical, one of the largest makers of chlorpyrifos-based products that has actively fought EPA limits on the chemical’s use, gave $1 million to President Trump’s inauguration committee and leads a presidential advisory committee on manufacturing. On March 28, Pruitt rejected the findings of the EPA’s scientists; denied a petition to ban the chemical; and delayed further action until 2022, when the EPA is required to re-evaluate its safety again. On March 28, President Trump signed an executive order nullifying much of former President Barack Obama’s Climate Action Plan. As part of that order, Trump directed federal agencies to stop using the social cost of carbon—the estimated economic cost of emitting 1 ton of carbon pollution into the atmosphere—in their cost-benefit analyses. The effect of this wonky change will be significant. If the EPA assumes that 1 ton of carbon pollution has no cost, then the agency will be unable to quantify the benefits of cutting carbon pollution. This will make it easier for Administrator Pruitt to defend weakening or nullifying the Clean Power Plan and other climate policies. Congress created the EPA Science Advisory Board, or SAB, in 1978 to “review the quality and relevance of the scientific and technical information being used by the EPA or proposed as the basis for Agency regulations.” The SAB receives significant cuts in the proposed budget: 84 percent from its operating budget and 14 percent from support staff resources. The board may only be able to conduct two peer reviews each year instead of 20. Congress is attacking the SAB as well. The EPA Science Advisory Board Reform Act, which passed the House in March, could prevent the nation’s top scientists from participating in the SAB if, paradoxically, they would be advising the SAB on matters related to their own expertise. The bill also could disqualify scientists who have received EPA grants while making it easier for industry stakeholders to participate in the process. The result would be to threaten the SAB’s ability to provide sound, unbiased scientific advice to the EPA administrator—which is probably the end the bill is designed to achieve. Rep. Lamar Smith (R-TX), an ardent climate denier who has been leading the congressional attack on science, introduced the Honest and Open New EPA Science Treatment Act, or HONEST Act. It passed the House in March. The HONEST Act would prevent the EPA from issuing rules based on scientific data or models that are not publicly available. The problem is that many data cannot be publicly released because they contain personal health records or trade secrets. As such, the bill could block the EPA from using the best available scientific evidence to set pollution limits or develop ambient air quality standards. This is not the result of poorly drafted legislative text—it is intentional. Rep. Smith has a long history of attacking science as a means of making it more difficult for the EPA to hold polluters accountable. These seven attacks—which, sadly, are unlikely to be the last—are part of a coordinated and deliberate agenda. President Trump, Administrator Pruitt, and their allies in Congress want to obscure the science that clearly demonstrates the need to cut air and water pollution by the powerful corporate interests that offer them the greatest political support. Without hard science in the way, they can more easily spin the story they want to sell—that corporations can pollute unabated without hurting our lungs, waterways, and climate. Myriam Alexander-Kearns is a Policy Analyst for the Energy and Environment Policy team at the Center for American Progress. Alison Cassady is the Director of Domestic Energy and Environment Policy at the Center.